Can enough be written about the dangerous distractions of personal electronic devices? Not when the latest news is of text messaging by an airline pilot taxiing for takeoff. When the National Transportation Safety Board meets on Tuesday to determine what caused the fatal crash of Continental Connection flight 3407 last February, it will hear how the first officer on the flight sent two text messages from the cockpit. The text messages have not previously been reported but they are described in a document that will be part of Tuesday's public hearing. One text was sent prior to the airplane being given taxi clearance, the second was sent five minutes before takeoff. This is problematic on two levels. First, Federal Aviation Administration regulations prohibit any activity in the cockpit not related to the flight after the plane has pushed back from the gate until it has ascended to 10,000 feet. An exception to the rule, commercial airline pilots say, is when the airplane is holding on a taxiway with parking brakes engaged. It is not clear whether that was the case when the text was sent by Ms. Shaw, nor is it known who she was texting. More relevant to the texting is that five minutes before takeoff, all cell phones belonging to pilots and passengers alike, are supposed to be turned off. The crash of flight 3407, being operated for Continental by Colgan Air, killed all 49 people aboard the airplane and one person on the ground, when it crashed short of the runway in Buffalo on February 12, 2009. 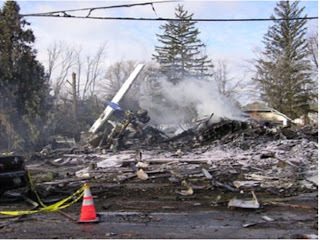 Much of the discussion of what caused the disaster revolves around Captain Marvin Renslow's handling of the airplane as it approached Buffalo. But sure to be on the agenda is Ms. Shaw's text messaging and other preflight behavior that demonstrates a lax attitude on the flight deck. Flight 3407 received a clearance to taxi at Newark Liberty Airport at 8:16 p.m. but did not take off until an hour later. During that period, Mr. Renslow and Ms. Shaw spent the entire time talking, only sixteen minutes of which involved the flight. This despite the fact that Newark airport was jam packed and weather along their route would be challenging. Instead, for forty five minutes Captain Renslow offered financial and career advice to the younger and less experienced Ms. Shaw, and provided a job by job account of his own aviation career. For her part, Ms. Shaw sniffed through an apparent head cold wondering why she came to work and complaining about her employer. She never mentions the text message to the captain and the report does not transcribe or otherwise give details about it. The public hearing into the crash is a "watershed" event according to John Cox, a former airline pilot, now a private air safety consultant, because of the extraordinary number of safety issues brought to light by the disaster. These include, handling of aircraft in stall conditions, pilot hiring and training, fee for lift arrangements that enable large airlines like Continental, Delta and United to make contracts with regional airlines that some say are less rigorously managed then they ought to be. But the news that Ms. Shaw was texting, and that both pilots were, for long periods of time, not attentive to the serious task ahead of them is also going to resonate with members of the safety board. For years now NTSB member Robert Sumwalt and Chairwoman Deborah Hersman, have sought to bring attention to repeated instances of non sterile cockpit. It was cited as a factor in the crash of Comair flight 5191, when pilots inadvertently took off on the wrong runway in Lexington, Kentucky in 2006. Prior to takeoff the two men had been involved in extraneous conversations, that while not about the flight itself, did indicate concern about the state of regional airlines. Forty nine people died in that accident. As recently as two weeks ago, the NTSB determined that a text-messaging train engineer was responsible for the collision of two trains in Chatsworth, California in September 2008. Twenty five people died when the commuter train hit a Union Pacific freight train. So while the chatty atmosphere in the Colgan Air cockpit will be a relevant part of the public hearing, the fact that an hour separates the Newark taxiway from what went wrong on approach to Buffalo certainly suggests that it won't be identified a contributing factor to the crash itself. But between the California rail crash and an episode last October in which pilots with Northwest Airlines over flew their destination in Minneapolis because they were absorbed by work on their laptops, the lesson is clear. Operator distraction has a dramatic and corrosive effect on transportation safety. The next question of course, is what to do about it? May I draw your attention to what Dr. Tony Kern has to say about this issue, HERE? Very astute posting. My take on this is that the brazen act of a probational FO pulling out her phone and texting in front of a Captain, shows an incredible comfort level with incredibly low (and illegal) standards.